Finding the right container is only half of the equation. Getting the container to you is the other half. Super Cubes will find the closest container to you to assure you are not wasting money on delivery. We offer two types of delivery to meet your needs: ground-level delivery and flat-bed/chassis. Depending on your use, we match the right delivery to your needs. Please note that we only deliver the containers that we sell. We do not containers once we have delivered them. We do not move containers you already own. We do not ship containers overseas. Ground-level delivery – We bring your container on a truck that can set your container down for you without needing any equipment on your part. The driver will back up the truck to the spot where you want the container set down. The back of the truck tips down and there is a winch that lowers the first end of the container onto the ground. Then, the driver pulls the truck forward and uses then winch to finish setting the container on the ground. During this process, the driver cannot turn the truck at all, we need the length of the container plus the length of the truck plus enough room for the truck to turn to get out of the spot. That translates to 110' for a 20' container and 130' for a 40' container. 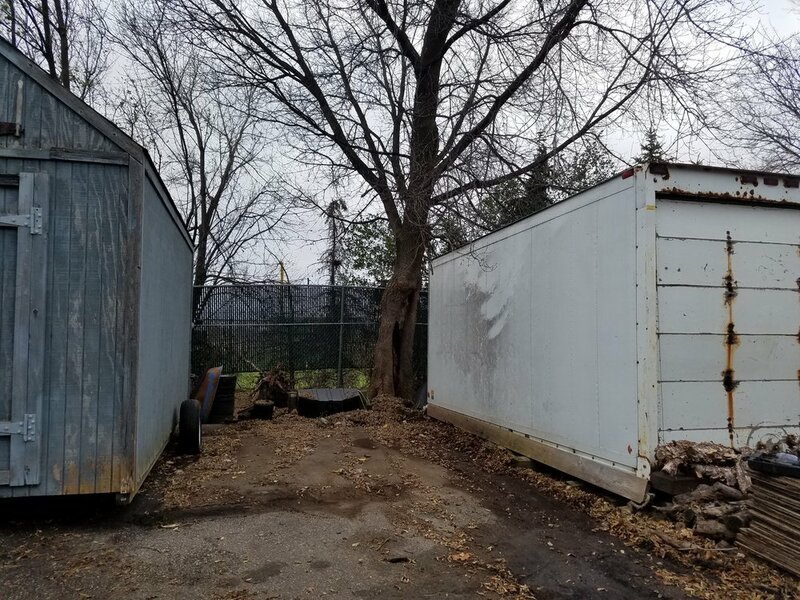 In addition, when we set containers on the ground, the container pushes down and out on the truck, so we need very firm ground that is relatively flat. Paved surfaces and gravel are best. We cannot delivery on grass/lawns or in fields. When sizing up the spot you want the container, please think about a truck maneuvering into that location including turning in off the road. See the video above to see a 40' container being set down. See below to see two 20' containers being set down. 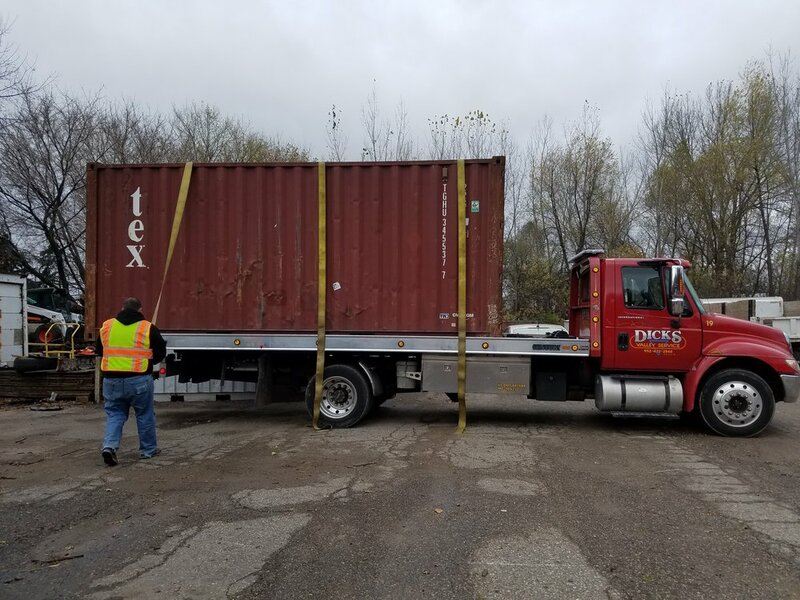 Please check out delivery of a 20' container on a straight truck. We have this option in most markets. Here is a straight truck with a 20' container on it. Here is a picture of the area before and after the delivery. Flatbed/Chassis delivery –If you can lift your container off of a truck, we can save you some money by delivering the container on a flat-bed truck or chassis. A standard 20' container weighs 5,000 pounds and a 40' is just shy of 10,000 pounds. While container forklift pockets are generally wider than most forklifts, they can be picked up by a forklift with 8' or longer forks or they can be picked up by the corner castings. Export – If you are shipping your container overseas, we can sell you a container and have it available in the nearest port/rail city for you. 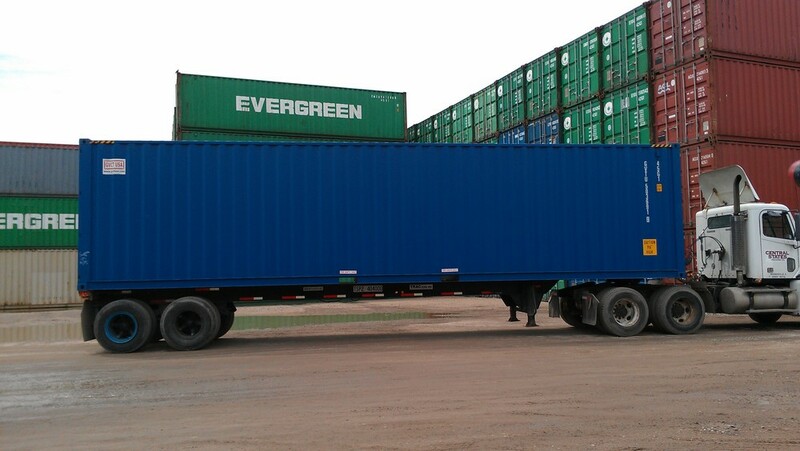 The cheapest and easiest method to load the container is to have your shipping line or freight forwarder arrange to pick the container up from our location and put it on a chassis (container trailer). They will take the container on the chassis to you for loading. Once the container is loaded, they will bring it to the rail or port. Rail and port locations have strict rules about which drivers are allowed in for deliveries as well as the types of trailers they use for transporting containers. For this reason, we do not offer this service. But we are happy to make sure that things go smoothly for your shipping line or freight forwarder when they pick the container up from our location.